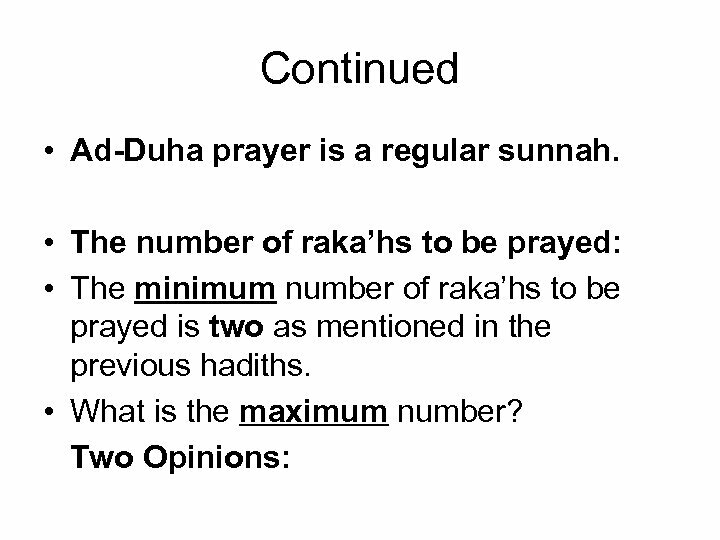 Continued • Second Opinion: There is no maximum number of raka’hs for ad-Duha prayer. 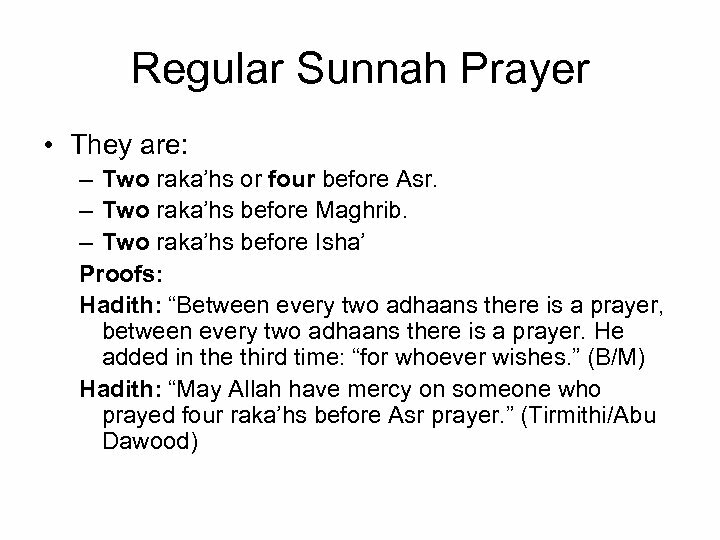 • Proof: Aisha ® said: “The Prophet (pbuh) would pray four raka’hs for ad-Duha and would add to it whatever Allah willed. 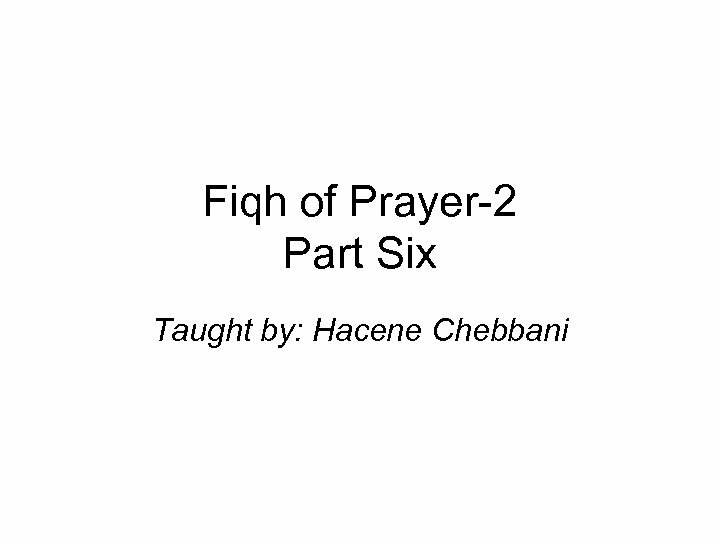 ” (M) • Refutation of the first opinion: • The prayer in Umm Hani’s house was not ad. 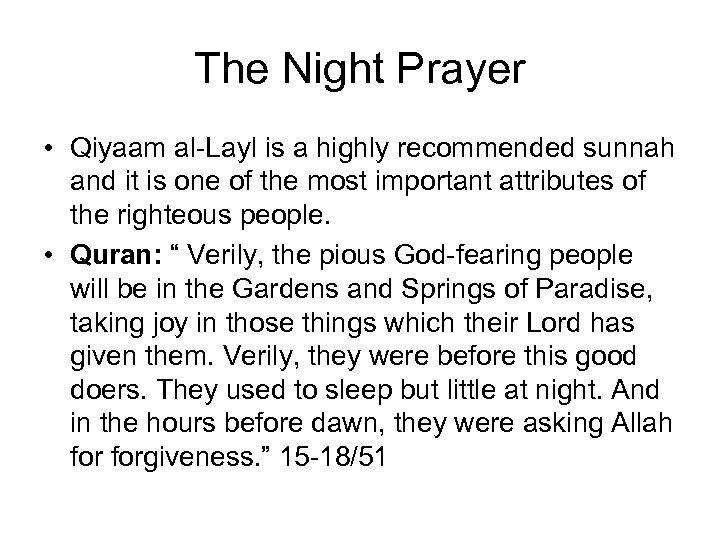 Duha prayer, rather it was a “prayer of gratefulness. ” for the conquest of Makkah. 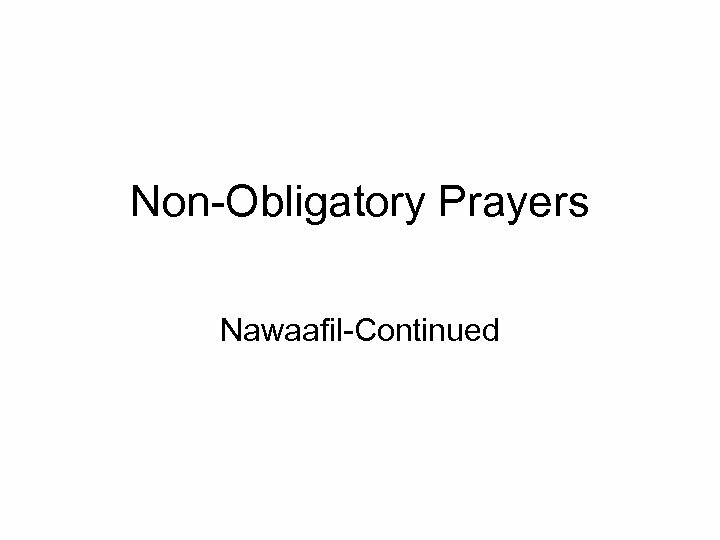 • This prayer is an isolated act that does not imply any restriction. 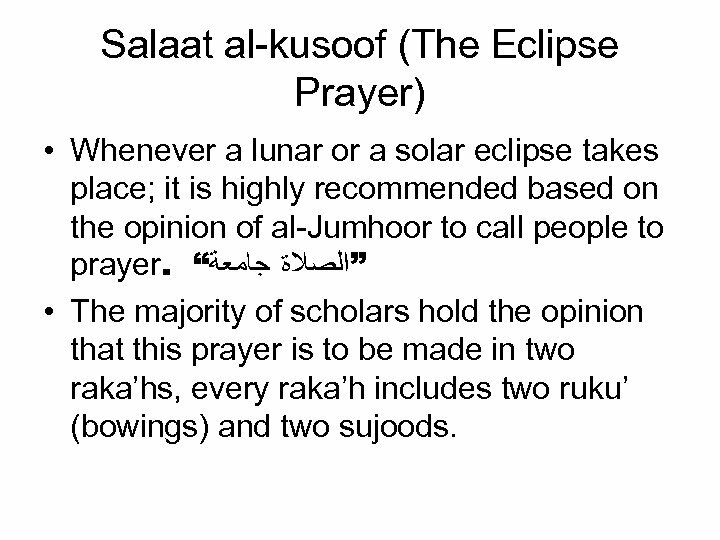 Salaat al-kusoof (The Eclipse Prayer) • Whenever a lunar or a solar eclipse takes place; it is highly recommended based on the opinion of al-Jumhoor to call people to prayer. “ ”ﺍﻟﺼﻼﺓ ﺟﺎﻣﻌﺔ • The majority of scholars hold the opinion that this prayer is to be made in two raka’hs, every raka’h includes two ruku’ (bowings) and two sujoods. 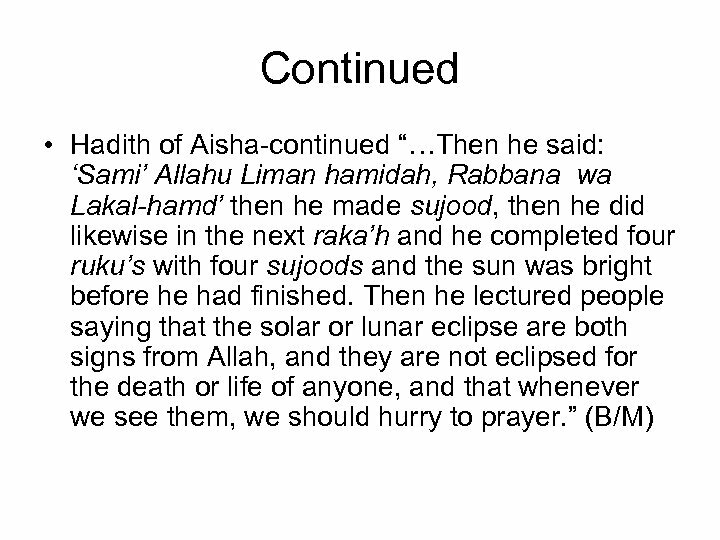 Continued • Aisha ® narrates: “There was a solar eclipse during the time of the Prophet (pbuh). He went out to the masjid and arranged the people in rows behind him then made takbeer, then he made a lengthy recitation, after which he made takbeer, then he made a lengthy ruku’, then he raised his head saying: ‘Sami’ Allahu liman hamidah, Rabbanaa wa Lakal-hamd’, then he stood up without making sujood and made another long recitation, but shorter than the first one. 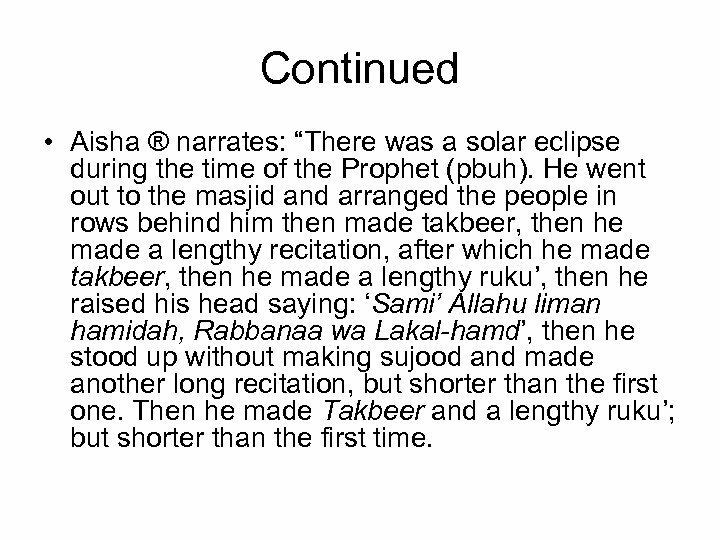 Then he made Takbeer and a lengthy ruku’; but shorter than the first time. Continued • Bukhari and Muslim also recorded that Ibn Abbas ® narrated the same hadith. 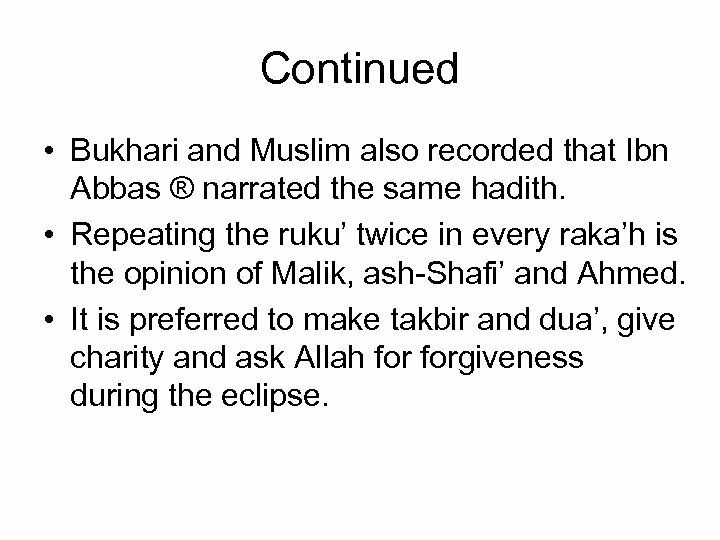 • Repeating the ruku’ twice in every raka’h is the opinion of Malik, ash-Shafi’ and Ahmed. • It is preferred to make takbir and dua’, give charity and ask Allah forgiveness during the eclipse. 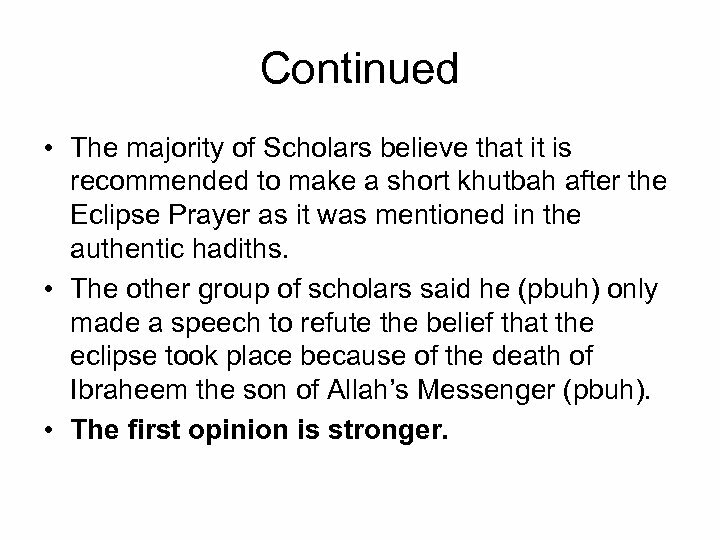 Continued • The majority of Scholars believe that it is recommended to make a short khutbah after the Eclipse Prayer as it was mentioned in the authentic hadiths. • The other group of scholars said he (pbuh) only made a speech to refute the belief that the eclipse took place because of the death of Ibraheem the son of Allah’s Messenger (pbuh). • The first opinion is stronger. 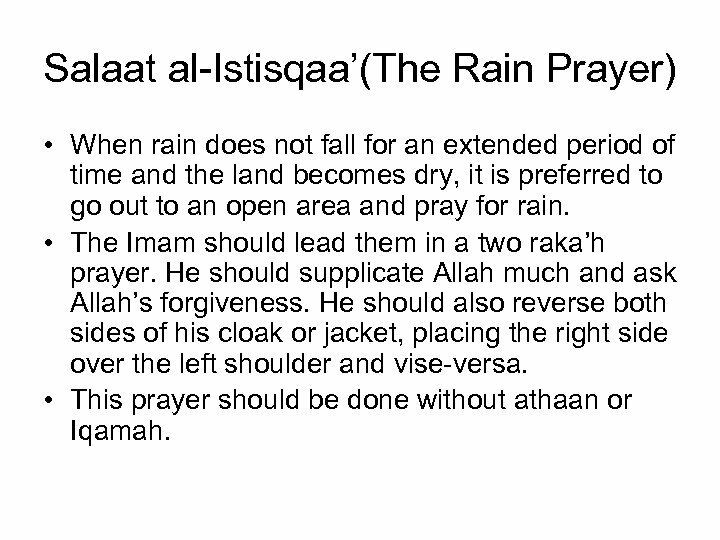 Salaat al-Istisqaa’(The Rain Prayer) • When rain does not fall for an extended period of time and the land becomes dry, it is preferred to go out to an open area and pray for rain. • The Imam should lead them in a two raka’h prayer. He should supplicate Allah much and ask Allah’s forgiveness. He should also reverse both sides of his cloak or jacket, placing the right side over the left shoulder and vise-versa. • This prayer should be done without athaan or Iqamah. 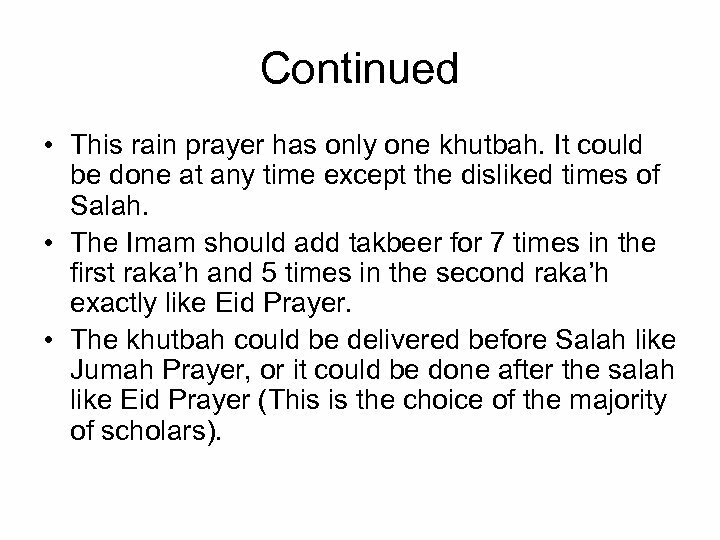 Continued • This rain prayer has only one khutbah. 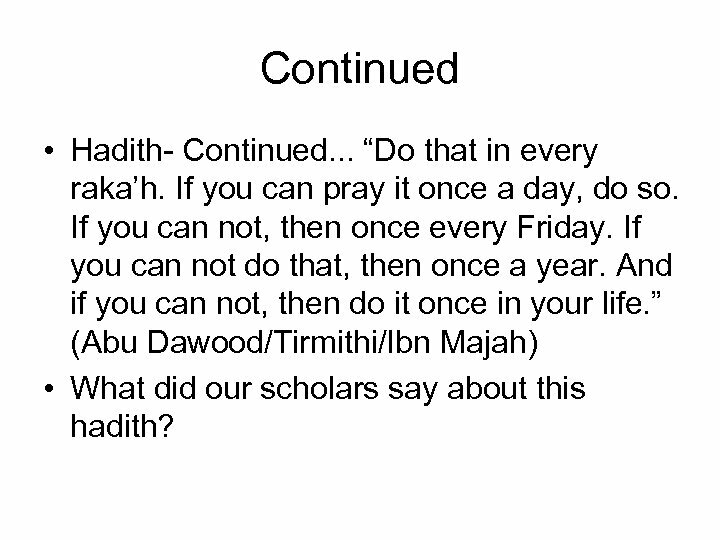 It could be done at any time except the disliked times of Salah. • The Imam should add takbeer for 7 times in the first raka’h and 5 times in the second raka’h exactly like Eid Prayer. • The khutbah could be delivered before Salah like Jumah Prayer, or it could be done after the salah like Eid Prayer (This is the choice of the majority of scholars). 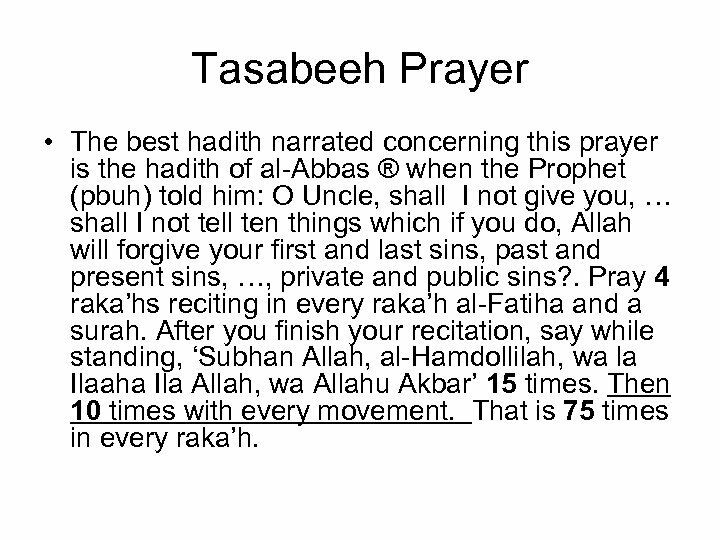 Tasabeeh Prayer • The best hadith narrated concerning this prayer is the hadith of al-Abbas ® when the Prophet (pbuh) told him: O Uncle, shall I not give you, … shall I not tell ten things which if you do, Allah will forgive your first and last sins, past and present sins, …, private and public sins? . Pray 4 raka’hs reciting in every raka’h al-Fatiha and a surah. After you finish your recitation, say while standing, ‘Subhan Allah, al-Hamdollilah, wa la Ilaaha Ila Allah, wa Allahu Akbar’ 15 times. Then 10 times with every movement. That is 75 times in every raka’h. Continued • Hadith- Continued. 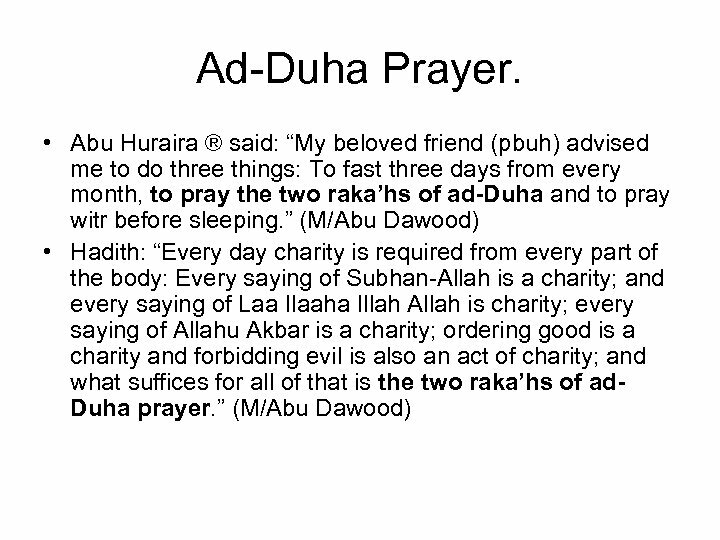 . . “Do that in every raka’h. If you can pray it once a day, do so. If you can not, then once every Friday. If you can not do that, then once a year. And if you can not, then do it once in your life. ” (Abu Dawood/Tirmithi/Ibn Majah) • What did our scholars say about this hadith? Continued • Al-Nawawi: “This hadith is weak. ” • Ad-Dhahabi: “He could not make a decision about this hadith. 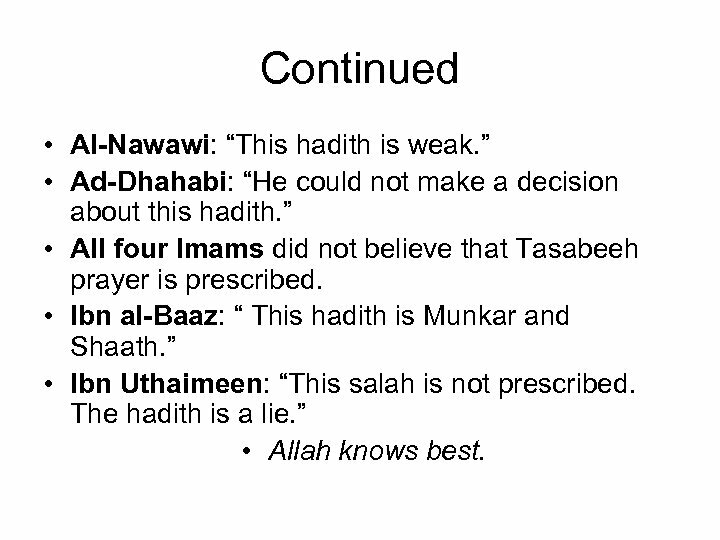 ” • All four Imams did not believe that Tasabeeh prayer is prescribed. 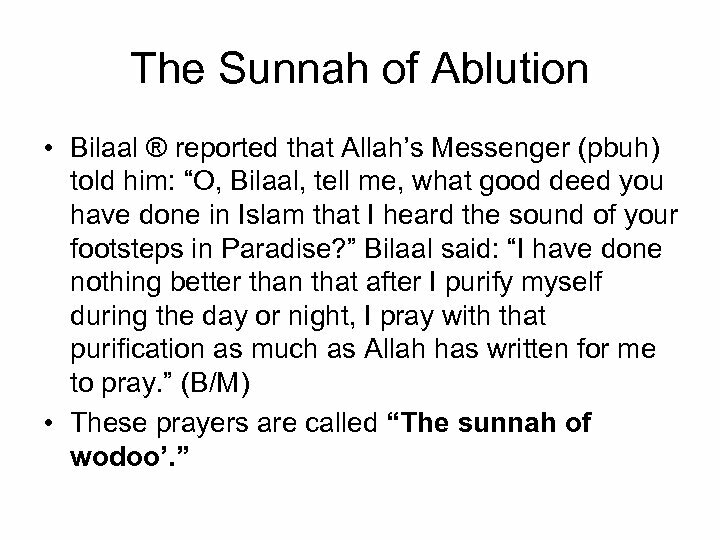 • Ibn al-Baaz: “ This hadith is Munkar and Shaath. ” • Ibn Uthaimeen: “This salah is not prescribed. 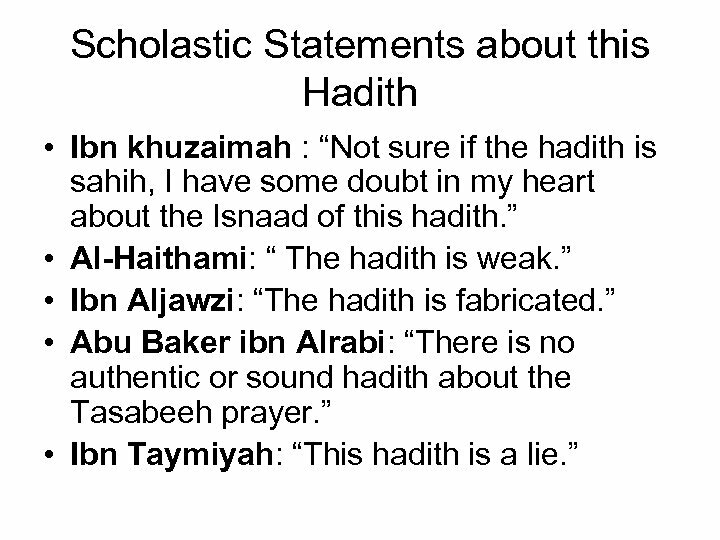 The hadith is a lie. ” • Allah knows best.